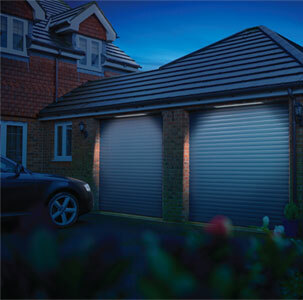 The SeceuroGlide was one of the first insulated roller shutter garage doors to be launched in the UK. Since that successful launch, its position and reputation within the market as well as its level of public popularity has soared due to persistent loyalty to development and innovation in the product. Manufactured using a strong double-skin aluminium slat with an insulating core, it provides a well-insulated and secure curtain that is also held in place with high performance webbing that is unaffected by extremes of temperature. This provide smooth, dry running in the guides and ensures a quiet operation unlike 'end-locked' roller shutter curtains. A strong extruded top slat and a SeceuroGlide patented comb locking mechanism effectively resist attack from would-be intruders. SeceuroGlide is available in a choice of fourteen paint or wood-effect finishes allowing you to match your new roller door to any existing paintwork or double-glazing for a coordinated look to your home. The high performance weather-stripping in the guides also ensures a good level of sealing and when closed, the door has excellent acoustic and thermal properties. A large bottom rubber seal ensure a good barrier to dust, leaves and any unwanted visitors. SWS Seceuroglide roller shutters allows you to park right up to the roller door on both sides and still allowing you open or close the door with ease. The internal space requirements are also minimal - enabling maximum use of your roof space inside the garage. Vertical opening means you can install this door behind any shaped structural garage opening without fouling the door curtain. The roller door is ideal for arched openings of all shapes and sizes. Each Seceuroglide roller door is individually manufactured to your requirements meaning you get the exact sizes to maximise your garage opening. The Seceuroglide door is remote controlled, electrically operated as standard using the NRG motor, complete with a comprehensive 5 year warranty and a choice of remote handsets to suit you. Or upgrade to the world renowned Somfy Motor Unit at an additional cost. Wide range of low maintenance finished colours, including textured woodgrain finishes to exactly match the latest generation of PVC windows and doors. Renolit woodgrain options also available as well as any RAL colour option for 2013 onwards. All styles are design for easy maintenance allowing you to enjoy your door without needing to put too much time into maintaining the door. There are five different styles SWS provide in their roller shutter door range that’s available on the market. Each style has their own properties that make them all unique. Dependant on what you are looking for, SeceuroGlide offer a range of doors to suit all. However this does not affect your warranty at all as they all come with a 5 year warranty for peace of mind with your door in the event of an incident. Safety is a fundamental concern in the continuing development of the range. All SeceuroGlide roller doors are fully CE compliant and come as standard with Safety Edge collision detection and Anti-Fullback devices where required. This means the SeceuroGlide will retract at any point a resistance is detected. This includes on the bottom slat sensor or if something got caught in the rolling mechanism. Any remote control garage door without compliant up to date safety features is not only illegal but can be very dangerous. A tight coiling curtain design and discreet optional boxes maximize the drive-through height of your garage - ideal for larger vehicles such as 4x4s and people carriers. There is no intrusion into overhead storage space within the garage as you do not require any tracks, and without the kick-out of traditional 'up and over' doors you can park safely inches from the door. The built in courtesy light in the control box providing light when opening the door and internal manual override is also a standard feature. Other useful accessories to consider include key switches, battery back-up systems, wireless digital keypads and multi-channel transmitters for incorporating electric gates, etc. The SeceuroGlide range of doors is Secure By Design which gives peace of mind that no one will be able to enter their property. The integrated slats are linked at the top and bottom with the next slat and at the bottom a secure rubber seal, which not only prevents unwanted debris entering but also stops unwanted visitors. 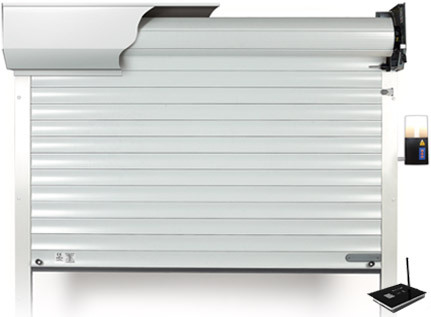 Once the SeceuroGlide door is sealed shut, the slats close together so there are no gaps between each of the slats preventing the chances of someone wedging an instrument between the slats. 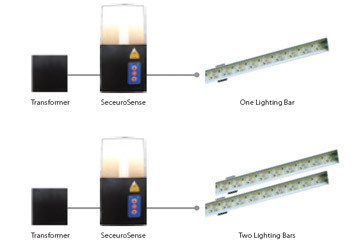 Automatic anti-lift locking and SeceuroSense receiver units featuring rolling-code technology ensure there is no other insulated roller door available more secure than a SeceuroGlide. With the ability to use your garage door from your phone, this added extra can provide useful and helpful operation to your garage door when you don’t want to carry a remote control with you while going out and about. With a simple plug and play facilities; it requires an easy step by step set up that doesn’t take long to initiate and used your home Wi-Fi to control your door. 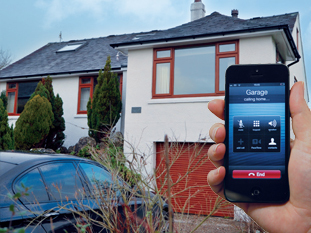 Because it is classed as a ‘Plug and Play’ setup, no software or application is needed to control your door from the comfort of your phone. If you wish to upgrade your SeceuroGlide Connect to the Conect+ you can control your SeceuroGlide door with a simple text message or phone call. With the Connect+ you can request a status on your garage door to see if everything is in good working order and even to check you closed the garage door behind yourself.